Note: some sources refer to Brierdene as Briardene, and Halt has been appended to the name. The station was 53 chains from the junction with the Avenue Branch (Monkseaton – Hartley). As at Collywell Bay the main building and signal box were to be on the east platform with a waiting shelter on the west platform. The description of the building which follows is compiled from Bill Fawcett’s article and sketches of Brierdene Station in North Eastern Express no. 147. The station entrance was at the north end of the block, with a glazed verandah behind which was a glass roofed booking area which fronted the office. The overall shape of the building was the favoured NER single storey block with cross wings at each end clasping a platform verandah with a glazed front. Unlike some of the later NER stations (Selby-Goole and Darras Hall branch) the building was to be largely of brick rather than timber. A cupola with finial and weathervane were included to add an extra note of distinction. The platforms were built, connected by a non-standard design footbridge. A signal box was partially constructed towards the south end of the east platform, with what was possibly a permanent way shed immediately south of the platform ramp. When the Collywell Bay project was abandoned the footbridge was dismantled and found a new home at Byker station (see Byker entry: 1964 photograph). It is not known how long the other structures remained in place. The NER expected to introduce the passenger service at the beginning of November 1914, and the name Collywell Bay was added to the destination blinds on the Tyneside electric stock. Construction was at an advanced stage when World War I broke out in August 1914, and the project was halted. A double line of permanent way was in place as well as the station platforms, bridges and signal boxes. 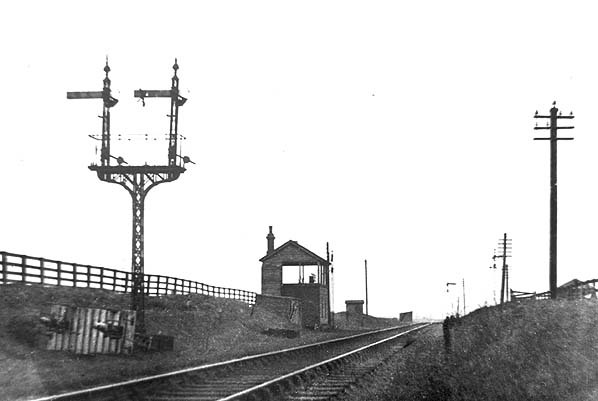 A stretch of electric ‘third rail’ was laid at the Monkseaton end of the Avenue branch, the signal box at Brierdene Junction was constructed, and the new Monkseaton station was nearing completion: this station opened the following year. On the outbreak of war house building in the area ceased. In 1916 the Ministry of Munitions and Railway Executive Committee, faced with a shortage of essential materials, decided that new rails could be acquired by singling lightly used lines. In 1917 the rails of the Collywell Bay branch were therefore lifted. 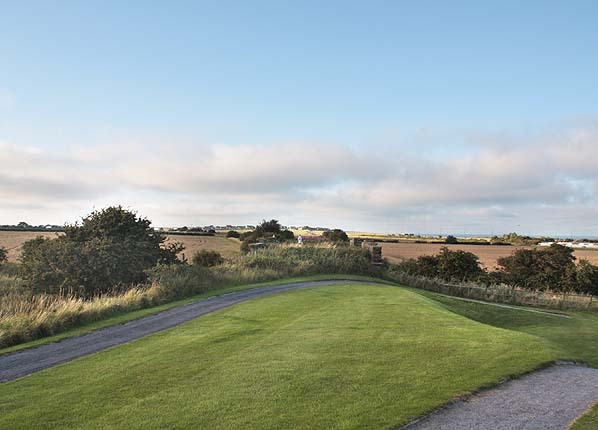 However a 1 mile 1,754 yard stretch of single line was restored using second-hand track (probably before the end of that year) to be used by a naval coastal defence gun, mounted on a specially built railway wagon. Brierdene station, looking south c1930. The platforms were constructed, with a signal box on the intended up platform. The building beyond is possibly a platelayer’s hut. 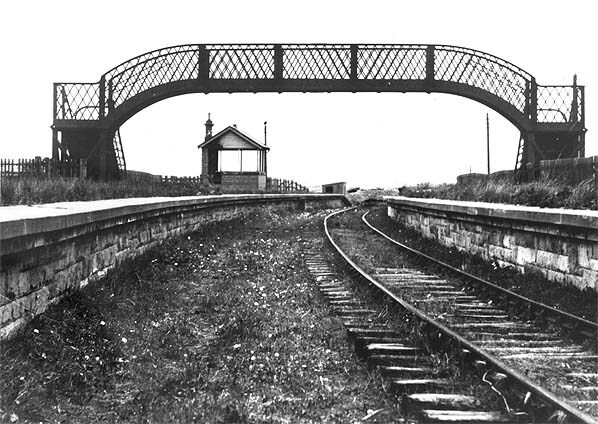 The station building was to have been on the up platform, between the footbridge and the signal box, and a waiting shed opposite on the down platform. The footbridge was formerly at Monkseaton station and would later be moved again, to Byker. The single track through the station was laid in World War I for use by a coastal defence gun mounted on a railway wagon. 1919 1:2,500 OS Map.The station – which never opened - is shown as complete, with detail of the internal layout of the main building on the east platform and the waiting shelter opposite on the west platform. All evidence suggests that, in regard to the buildings, the map was showing intentions rather than reality, although the absence of grey infill might be significant. However the footbridge, shown on the map, was built. The single track serving the west platform is presumably the length which was reinstated to carry the naval coastal defence gun, mounted on a wagon. The station approach road is shown. The broad area of railway land on the embankment immediately south of the east platform implies that goods facilities were to have been provided. 1938 1:2,500 OS Map. The Collywell Bay branch line project was abandoned in 1931, and the rails were removed soon after. By 1938 only the platform faces of Brierdene station appear to have survived within the fenced area that was formerly railway land. The bridge over the track, north of the station, has been dismantled, and the station approach road is no longer shown. Plan of the proposed building at Brierdene. This would have been sited on the up (east) platform. indicated as out of use. Looking south at the site of Brierdene station from the bridge over the approach road in July 1987. Looking north across the site of Brierdene station in August 2010. 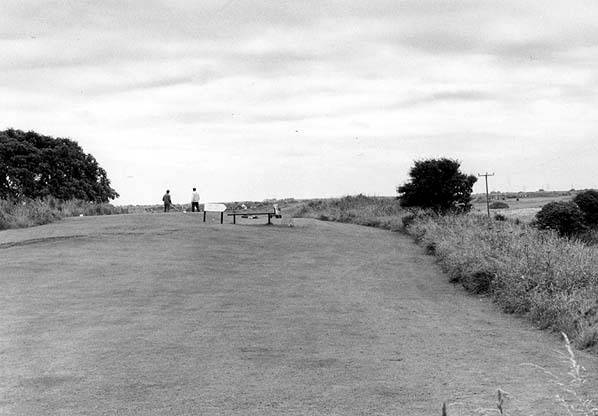 Nothing remains of the station, as it has long been demolished, and the site has been landscaped within Whitley Bay Golf Course. 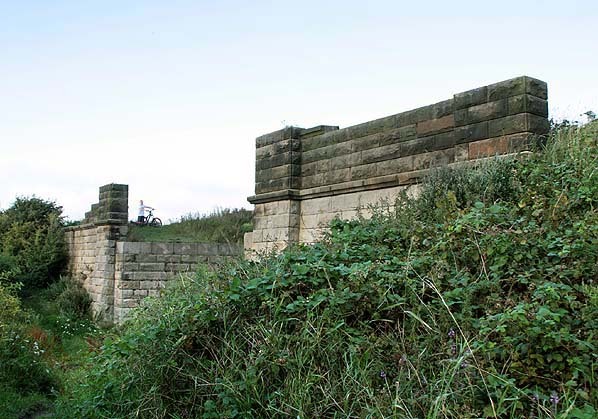 The deck of the former rail overbridge immediately north of Brierdene station was removed soon after the Collywell Bay branch was abandoned, but the sturdy sandstone masonry of the abutments remains in place.